← Sesbania grandiflora (Vegetable Hummingbird): Mood Stabiliser? Does Myricetin Reduce Anxiety and Depression? 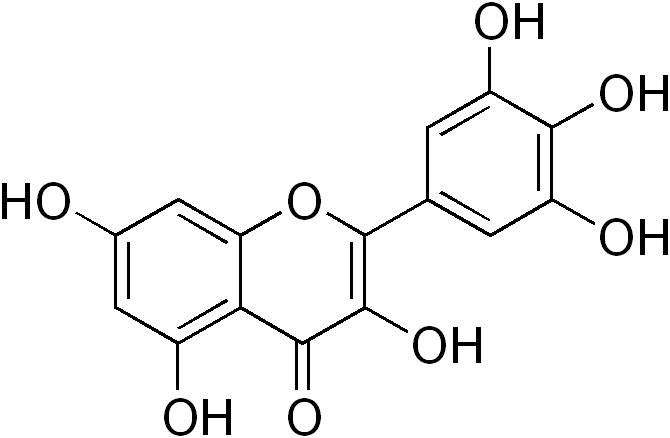 Myricetin is a flavonoid synthesised by plants. Myricetin belongs to the flavonol group of flavonoids. Other flavonnols found in plants include quercetin, kaempferol and galangin. The chemistry of the flavonols makes them biologically active and they may possess antioxidant, anti-inflammatory and immune modulatory activity. A reasonably large body of evidence suggests that quercetin and kaempferol have mood elevating effects in animals, and this might suggest that myricetin was also beneficial in this respect. In fact a few studies have investigated the effects of myricetin and found it to possess some mood elevating properties. For example, myricetin extracts from Vitis vinifera (grapevine) have been shown to exhibit significant anxiolytic effects on mice when the animals are exposed to experimental stress. The authors suggested, based on observations of interactions with drugs, that myricetin may have been modifying the serotonin systems of the brains of the mice. In another study researchers investigated the effects of myricetin on depression. Mice were administered myricetin and then exposed to experimental stress. The mice receiving myricetin showed behavioural changes that were consistent with a reduction in depressive symptoms. Myricetin is a potential antioxidant in animal, and the researchers noted that administration of myricetin to the mice significantly increased cellular level of glutathione peroxidase in the animals, suggesting a positive antioxidant effect. The levels of glutathione peroxidase were increased in the hippocampus, suggesting this antioxidant effect was present in brain tissue. Myricetin also normalised elevated levels of corticosterone in mice and decreased levels of brain derived neurotrophic factor in the mice, suggesting that it has had an anti-stress effect. Myricetin, like quercetin and kaempferol may therefore have beneficial effects on mood disorders, by exerting beneficial changes to brain chemistry and stress levels. Galangin, kaempferol, quercetin and myricetin are flavonols. They are found in high concentrations in many fruits and vegetables. The flavonols act as biological antioxidants because they contain hydroxyl groups. Galangin, kaempferol, quercetin and myricetin possess 1, 2, 3 and 4 hydroxyl groups, respectively. The more hydroxyl groups a compound contains, the better its antioxidant potential, as it is the hydroxyl groups that acts to quench free radicals. Image is myricetin. Image from: By Edgar181 – Own work, Public Domain, https:// commons.wikimedia.org/ w/ index.php?curid=3092575. It is unclear if flavonols act as anxiolytic agents themselves or are metabolised to other compounds prior to having biological effects. Flavonols such as quercetin, kaempferol and myricetin are metabolised by gut bacteria to their corresponding hydroxphenylacetic acids. In one study, when quercetin and kaempferol were injected into animals, the anxiolytic effect were not present. However, oral administration did produce anxiolytic effects. Therefore, the metabolism of kaempferol and quercetin to their respective hydroxyphenylacetic acids, para-hydroxyphenylacetic acid and 3,4-dihydroxyphenylacetic acid may be a requirement of the anxiolytic effects. In this regard the hydroxyphenylacetic acids, para-hydroxyphenylacetic acid and 3,4-dihydroxyphenylacetic acid did show anxiolytic effects after injection. Further after sterilisation of the gut with antibiotics, the anxiolytic effects of kaempferol of quercetin were attenuated, suggesting they must be metabolised before anxiolytic effects become apparent. This entry was posted in Anxiety, Depression, Flavonoids, Flavonols, Mood, Myricetin. Bookmark the permalink.